The Swiss settlement of Taranaki began in earnest when Felix Hunger went back to his homeland, then returned with a party of relatives and friends. 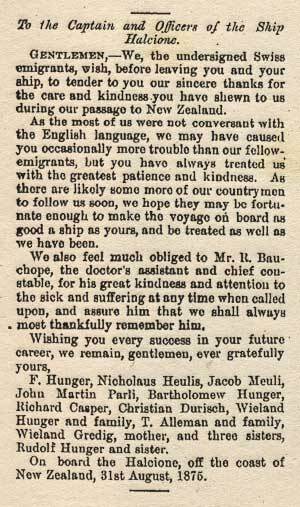 On their arrival in 1875 the migrants wrote this letter of thanks to the captain and officers of the ship on which they had travelled. The letter was published in the Taranaki Herald. Reference: Taranaki Herald, 4 September 1875.